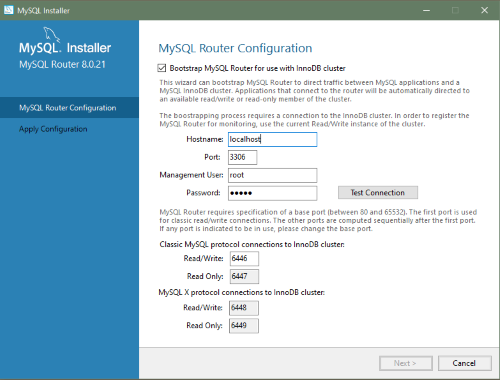 MySQL Installer provides a wizard-like tool to install and configure new MySQL products for Windows. Unlike the initial setup, which runs only once, MySQL Installer invokes the wizard each time you download or install a new product. For first-time installations, the steps of the initial setup proceed directly into the steps of the installation. Full permissions are granted to the user executing MySQL Installer to all generated files, such as my.ini. This does not apply to files and directories for specific products, such as the MySQL server data directory in %ProgramData% that is owned by SYSTEM. Product download. If you installed the full (not web) MySQL Installer package, all .msi files were loaded to the Product Cache folder during the initial setup and are not downloaded again. Otherwise, click Execute to begin the download. The status of each product changes from Downloading to Downloaded. Product installation. The status of each product in the list changes from Ready to Install, to Installing, and lastly to Complete. During the process, click Show Details to view the installation actions. If you cancel the installation at this point, the products are installed, but the server (if installed) is not yet configured. To restart the server configuration, open MySQL Installer from the Start menu and click the Reconfigure link next to the appropriate server in the dashboard. Product configuration. This step applies to MySQL Server, MySQL Router, and samples only. The status for each item in the list should indicate Ready to Configure. Click Next to start the configuration wizard for all items in the list. The configuration options presented during this step are specific to the version of database or router that you selected to install. Click Execute to begin applying the configuration options or click Back (repeatedly) to return to each configuration page. Click Finish to open the MySQL Installer dashboard. Installation complete. This step finalizes the installation for products that do not require configuration. It enables you to copy the log to a clipboard and to start certain applications, such as MySQL Workbench and MySQL Shell. Click Finish to open the MySQL Installer dashboard. For the MySQL 8.0 release series, a server can be configured to run as a standalone database, as a sandbox InnoDB cluster on a single host, or to create a production InnoDB cluster inside a local network (see Section 2.3.3.3.1.1, “High Availability”). Provides default installation and data paths for MySQL server. For instructions on how to change the default paths, see Section 2.3.3.2, “Setting Alternative Server Paths with MySQL Installer”. Select this option to create or extend an InnoDB cluster solution that is based on MySQL Group Replication (see Section 21.1, “Introducing InnoDB Cluster”). You can configure (or reconfigure) a minimum of three server instances to perform a basic setup as a test-only sandbox cluster on a single computer or to create a production cluster inside a local network. The Enable Enterprise Firewall check box is selected by default. For post-installation instructions, see Section 6.4.7, “MySQL Enterprise Firewall”. For more information about using MySQL as a document store and the X Plugin, see Section 20.2, “Document Store Concepts” and Section 20.5, “X Plugin”. Set up InnoDB cluster. For instructions on how to configure a sandbox InnoDB cluster on the local host using MySQL Installer, see Section 2.3.3.3.1.1, “High Availability”. For general InnoDB cluster information, see Chapter 21, InnoDB Cluster.